All buildings have an impact on the environment. From the pollution generated while manufacturing the materials to the environmental impacts of the building's construction, a large toll can be taken long before the building even opens. The building's energy use AFTER is also a huge energy drain, of course, which means there are many different stages of pollution and degradation. "Green building" means minimizing the environmental effects of building, and the technique requires the integration of environmental values into the decision-making process during design, construction, and beyond. Show off your eco-friendly construction here and make everyone turn GREEN with envy! I found this huge timber at The Lumber Guy in Denver, saving about 40% off retail! 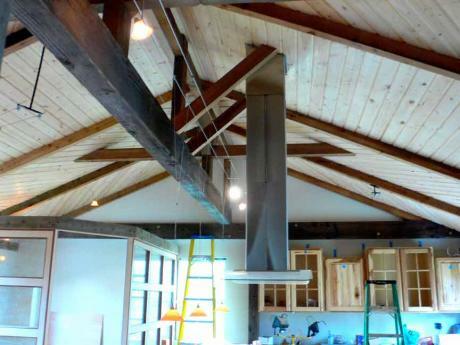 The client wanted exposed beams and he got it. I must say, this design took a lot longer to implement that I'd hoped, but I was happy with the end product and so was the client!